The Liberty University International Student Services held its annual Winter World Wide Welcome Friday, Jan. 24 during which international students from Liberty and other colleges in the area gathered at the Liberty Mountain Snowflex Centre to enjoy free food, fellowship and fun. According to Kristina Bautista, operations assistant and insurance representative for International Student Services, the Winter World Wide Welcome has been an annual event since 2004. 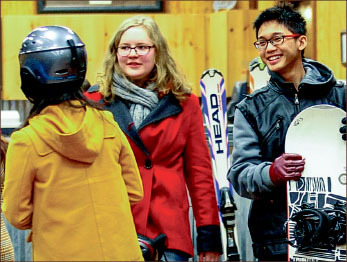 Students enjoyed many winter activities such as skiing, snowboarding and tubing. Students who preferred not to venture into the cold instead stayed warm in the lodge, socialized and played board games like checkers and chess. “At the Winter World Wide Welcome, the students get to know each other and the new students get plugged in and introduced to the culture,” Yuliya Shubina, a receptionist at the International Student Services, said. William E. Wegert, dean of International Student Programs, created this event to enable both new and returning international students to get to know one another. In addition, Liberty extended an invitation for the event to other international college students in the area. “We invite other colleges’ international students so our students can be connected with other colleges,” Bautista said. Shreeya Pandey, a Randolph College student from Nepal, came to the event two years ago and returned again this year. She said she had a lot of fun and enjoyed meeting new people and eating pizza. She added that she was very grateful that Liberty opened its facilities to the international students from local colleges. According to Wegert, each student has a different story and experience. “Every student has a story, and I get to hear that story. I have the best job on campus,” Wegert said. Alfred Khuri, a Liberty senior from Jerusalem, said he enjoyed the fact that the event was not structured, but that it had a relaxing and casual atmosphere that was perfect for socializing and mingling. “My favorite part of this event is just hanging out with people I know,” Stosic said. International Student Services records indicate that approximately 100 students attended the event this year. For more information about future International Student Services events, visit liberty.edu/international.